Thondavada is a historical village in Chandragiri mandal of Chittoor district. It is 10 km from the town of Tirupati and is home to a major temple for lord Siva called Agastheeswara. The temple of Agastheeswara Swami is a sacred shrine that lies at the confluence of three rivers Swarnamukhi, Bhima and Kalyani. 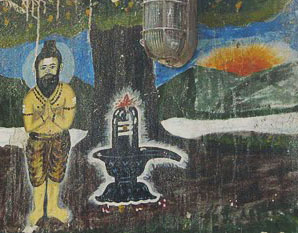 The Siva lingam in this temple was installed by Agasthya muni and so it is called Agastheeswara lingam. This temple faces east and has almost all parivaradevathas installed in well-built places like Lord Ganesha, Lord Subramaniyam. The temple has three entrances and a grand compound wall. The Dwarapalakas at the entrance of the sanctum sanctorum are beautifully sculptured. They stand tall to add grandeur to the hall. Inside the second prakara, there is a separate shrine for Mother Parvati called here by the name of Vallimata. There is a tank outside the compound for the convenience of visiting pilgrims. The near by village was named Tondavada by the kings of Chandragiri, as it was the place used as a rest house for visitors and keeping elephants also. Just opposite the temple and in the middle of the river there is a mandapam built. In this, you can see the beautiful statues of Balaji, Ayyappa, Ganapati, etc., installed. There is also a small shrine of Lord Sri Rama, Sita, Lakshmana and Anjaneya that is built in recent times near the tank. All these places are worth visiting. Agastheeswara Swamy Temple at Thondavada is a very nice temple which I mentioned in my blog also. Thanks for sharing this informative article with us.